Lori, I am in the same boat as you! You are not alone! I too, have tried several times to read her works and just couldn't get into them at all! I have not read one of the Jane Austen Novels..no Jane Eyre...but I do like to watch them being played out in a movie. So I like the emotional stuggels that one can really think they are above another but then when their social status turns. I fall for a good love story. I'm amazed how insightful she was. So it's not your thing that's okay. The slide show was fun to do just download them and they "Slide" make you look good. You can just pic the formats you want. I'm not sure if I can guess why you don't like Jane, but to each his own! Maybe she's so widely praised that she can't live up to her own reputation in your eyes -- that happens to me sometimes; most memorable example: the movie "My Big Fat Greek Wedding" -- I HATED it, and maybe moreso because it was so built up to me by so many people! There are many, many books everyone raves about that I just can't begin. This is the way I feel. I love her stories, I love her life story. She is a very interesting person. And while I love all the movies based on her books and i love the story lines, I have a hard time reading her books. I have her whole collection and hope someday to sit down and actually get into them...but I have tried...just like you to read them and I find that I cannot get through one! So Im with ya! One book I've tried numerous times to read and just can't is 'Doctor Zhivago'. And I finally realized that there are waaay too great books out there to waste time on something that just doesn't grab me. So you don't like Jane Austen. Who cares? The important thing is you read. see, you are not alone...i don't like those books either...thanks for stopping over to visit me!!! Hahaha, I totally gasped seconds before I read that you'd have readers who gasp. But... but... but... have you read Persuasion? Now THAT is a good book :) And what about Pride and Prejudice and Zombies? Its filled with zombie mayhem! I'm with you on Jane Eyre. I used to love it, but then hated it the last time I read it. And don't even get me started on Wuthering Heights, which I loathe. 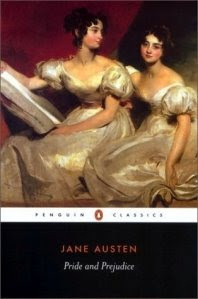 As for Jane Austen, I also used to love her stuff, but found myself skimming sections the last time I read P&P. as an english major, i know what you mean. lol. sometimes, something does not click well when it comes to a certain author. i don't mind jane austen, but I DO mind walt whitman. call me a loser but AHHHHHH!!!! I'm not a big Austen fan either... and I have tried! So don't feel bad - there are plenty of other wonderful gems out there to spend your time on instead. I have to laugh. I also picked up Pride and Prejudice and could not get into it. I LOVED the movie adaptions, but could never get into the book. Ooooh, I LOVE Austen! Bronte can be a bit of a trial if you're not in the right frame of mind, but Austen is a breeze. Just prepare yourself for the mindset in which it was written - light, fluffy and very old-world female! I don't read her, I watch the movies! I HATED reading Jane Eyre!!! I've not read a Jane Austin since HS. Have you seen the PBS Great Masterpiece version of her stories? NICE! Or the one with Hugh Grant in Sense and Sensability(sp?) GOOD movie! I can watch 'em better than I can read them. You are not alone! I haven't been able to chew my way through that book either and I love reading. Try Emma instead. You can really see her sense of humor in that one. It's my favorite. *blushing* I did gasp in a very loud way when I read about not liking Jane Austen...and then I laughed out loud when I read the part about no gasping! I'm so in love with Pride and Prejudice and Sense and Sensibility, they are my "comfort" books. I have read them lots of times, and I always pick them up when I'm feeling blue. I read Jane Eyre once and although I finished it I'm not crazy over reading it again... and I'm 100% with you on Wuthering Heights, didn't like it one bit. LOL! I love that everyone who loves Jane really did gasp! I love Jane Austen but as much as I love her and I do love the books, I can see why it would be hard to like her. She can be wordy, and her language is archaic, especially the conversations which tend to get cut shorter and made livelier when adapted to the screen. Like someone said, you need to put your mind into the mindset in which it was written. Light, fluffy, and very subtle English satire. Oh, you are a brave woman, Lori, bringing this up! I can understand where you are coming from on some level... I love Jane Austen (books & film adaptations) but while I've enjoyed so many adaptations of "Jane Eyre," I sat down to try to read the novel with my son a few years back and we both wanted to SCREAM! We agreed that book would never get published in this day! It seemed so poorly written by today's standards. But Jane Austen, her language flows. All I have to do is read a bit of her and suddenly I'm speaking in the language of her time. (My son just knows Mom has been watching too many "tea party movies" again!) Her characters are lovable--even the ones who are not. You always know what to expect in a Jane Austen novel...and in the society of her time. It may not be to our liking today (I would HATE to be a woman living in Austen's time period)...but there's something comforting in having the rules of behavior clearly established. I find her fiction a fun "getaway" for the time that I read. So anyway, those are a few of the things I love about Jane Austen--that and she can be very witty at times! But we all like to read different things...and that's cool too. The main thing is, "Read on!"